I wasn’t a fan of Mindy Kaling before I read this book, but I was when I finished it. This is not the intellectual autobiography of the year, but it was fantastic. If you’re looking for a quick ( it took me about four hours to read),funny read , I would definitely recommend this. Kaling has an easy, yet interesting and extremely witty writing style, and the book is full of lists which I absolutely loved. Throughout the book Kaling discusses her struggle with her weight in a way a lot of people can identify with, and she deals with it in a sincere yet humourous way. It was really interesting to watch Mindy's career develop, and here about the ins and outs of the industry. The book has been compared to Tina Fey’s Bossy Pants , and I suppose it is similar as they are both a series of personal essays written by two extremely witty women. 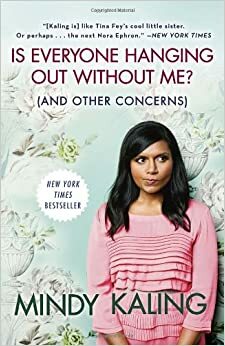 This book made me want to be best friends with Mindy Kaling, she seems like an absolute riot, and I wish I had read this book when I was a bit younger. The book is a bit short, by the time it was finished I was hoping for more. This book might not be high literature, but it succeeded one hundred percent in it’s aim, so I’m going to give it five stars. Side note: This book was unbelievably hard to get a hold of in Ireland,(a friend brought my copy back from America), so if you're looking for it you might just be better off ordering it online.